UPDATE: Check out the Zru Vogue website for more info on Science Patrol, Andrew Jackson, and Rick Cuevas. Two previously unreleased Science Patrol tracks were included on a 3-LP box set of 80's post-punk techno music (an international compilation featuring artists from Europe and the US). The box set was limited to 500 and produced by Genetic Music in 2003. Click on band member names below for info on other projects by band members. There is a limited number of Science Patrol singles left, thanks to foil guitarist Rick Cuevas. You may contact him at rick@zruvogue.com for more info. This single is Science Patrol's only release. 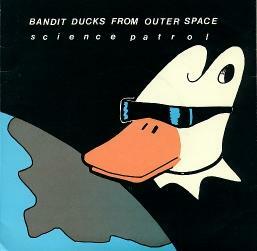 "Bandits Ducks" is a true classic, one of the greatest songs of all time.